Is Stan Smith still protecting the USA during the 14th season of the American Dad! TV show on TBS? As we all know, the Nielsen ratings typically play a big role in determining whether a TV show like American Dad! is cancelled or renewed for season 15. Unfortunately, most of us do not live in Nielsen households. Because many viewers feel frustration when their viewing habits and opinions aren’t considered, we invite you to rate all of the American Dad! season 14 episodes for us here. An animated TBS sitcom, American Dad! centers on super-patriotic CIA Agent Stan Smith and his unorthodox family. In addition to his wife and kids, the household also includes a unique goldfish and an alien. The voice cast features Seth MacFarlane, Wendy Schaal, Scott Grimes, Rachael MacFarlane, Jeff Fischer, Patrick Stewart, and Dee Bradley Baker. What do you think? Which season 14 episodes of the American Dad! TV series do you rate as wonderful, terrible, or somewhere between? Are you happy TBS renewed American Dad! through season 15? Don’t forget to vote, and share your thoughts, below. 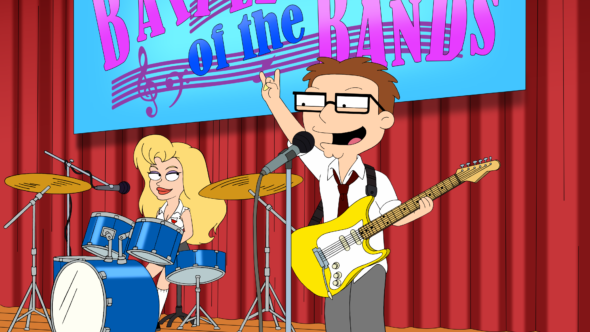 More about: American Dad!, American Dad! : canceled or renewed?, TBS TV shows: canceled or renewed? American Dad! Is the TBS TV Series Cancelled or Renewed for Season 14?